Win Black Sea: Drama below the surface | SWITCH. From Academy Award winning director Kevin MacDonald (Touching the Void, The Last King of Scotland) and starring Jude Law (Cold Mountain, The Talented Mr Ripley), this gripping and suspenseful thriller centres on a rogue submarine captain (Law) who pulls together a misfit crew to seek out a sunken treasure lost in the depths of the Black Sea. But greed and desperation soon take hold on board their claustrophobic vessel. A shocking betrayal, a startling discovery and escalating uncertainty about the mission cause the men to turn on each other. As the situation reaches breaking point, the crew must make an uneasy truce if they hope to ever make it back to the surface alive. The 'Black Sea' competition has now closed. Winners will be announced shortly. Competition opens at 5pm AEST on Sunday 9th August 2015 and closes at 11:59pm AEST on Sunday 16th August 2015. Three winners will be chosen at random on Monday 17th August 2015. To successfully win, entrants must fulfil the above entry conditions before the time the competition closes. Current members/followers are eligible to enter the competition. Only one entry per person. Only one winner per household. To be a valid winner, the entrant must not have won a prize from SWITCH within the last 28 days. Each winner will receive one Blu-ray copy of 'Black Sea'. By entering, you agree to receive occasional emails from SWITCH in the future. If you decide to unsubscribe from these updates, any further entries will not be applicable. Only Australian residents are eligible to enter. 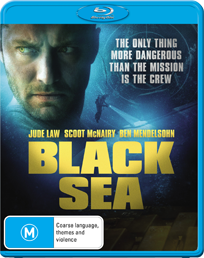 'Black Sea' is available on Blu-ray, Digital and DVD on Wednesday the 12th August 2015 from eOne.